Antoine is a father-of-three, living in Aleppo, Syria. Determined to stay alive for the sake of his wife, Georgette, and three young daughters, Antoine’s pact with God was to outwardly behave as a Muslim while secretly keeping his Christian faith. Antoine received a visit from a Daesh ‘Prince’ who told him to prepare for a special mission – to be a suicide bomber. With Antoine in the factory, where he was confined, was a British convert to militant Islam whose job was to persuade him to do the deed. Praying for deliverance, Antoine said that early one morning, while semi-conscious, he felt a tap on his shoulder from Our Lady; she was telling him to escape. Everyone in the building was at prayer and – seizing his moment – Antoine tiptoed to the main door. To his amazement, the chains and lock slipped open, the door swung wide, and he stepped out. He hauled himself over a high wall, ran through the high-security barrier between east and west Aleppo, and made his way to a relative’s house. 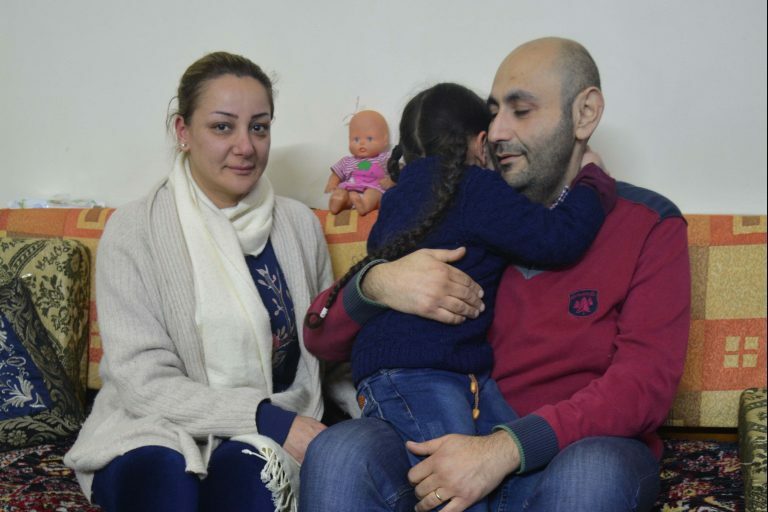 There, he was re-united with his wife, Georgette, and daughters – Gezel, aged four, Eleanor, three, and two-year old Roula.